As the 20th anniversary of the Exxon Valdez spill approaches, it's important to remember that oil (sands) and birds don't mix. I’m on my back on the aft deck of Raincoast’s research vessel. My repose is involuntary as we ply the lumpy waters of Haida Gwaii’s west coast. Not one prone to sea-sickness, I nevertheless feel like my head is virtually nailed down, a result of the interminable chop. I have no option but to look skyward and there, to my amazement, are albatrosses, escorting us like some squawking air squadron. For me, the albatross is the grizzly bear of marine birds in terms of its iconicity and, with a wingspan of over seven feet long, commanding physical presence. After experiencing the exhilaration of seeing the largest marine bird on the coast of British Columbia, I immediately reflect on the litany of human-caused hazards facing these majestic pelagics and other marine-bird species. Millions of marine and other coastal birds migrate offshore and along the B.C. coast while millions more breed here. Still others, including the aforementioned albatrosses, are long-distance migrants that breed elsewhere in the world and rely upon our coastal environment and its resources. Raincoast’s sightings include the more abundant Cassin’s auklet and white-winged scoter to the rare horned puffin and Laysan albatross. 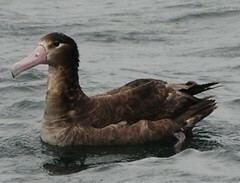 Standing out among the many birds observed was the exceedingly rare sighting of a lone, immature short-tailed albatross in the waters southeast of Haida Gwaii. Once numbering in the millions, this species was decimated by the demand for feathers and at one time was thought extinct. Raincoast’s sighting, just one of under 40 reported in B.C. since 1996, highlights the urgent need for longer-term monitoring of marine birds in B.C.’s remote coastal and offshore waters. As such, Raincoast scientists continue to seek to identify areas important for marine birds and examine the potential for conflict with increasing industrial activity, like tanker traffic and wind turbines. A recent report by the Pembina Institute and Boreal Songbird Initiative, detailed how the Alberta oilsands are killing both birds and their habitat. But the oilsands have the potential to impact avian life far beyond the songbirds and waterfowl migrating through and nesting in Alberta’s boreal forest. Fox also points out that researchers in Canada have estimated that as many as 300,000 seabirds per year are killed off Newfoundland and Labrador due to chronic oil pollution, a figure that is comparable in scale to the estimated mortality following the Exxon Valdez spill in Alaska. Similar to east-coast levels, the relatively high proportion of carcasses reported off the west coast of Vancouver Island that are oiled suggest that chronic oiling is also a concern for B.C.’s marine birds. A catastrophic Exxon Valdez-like spill would be devastating for the province’s marine-bird populations and the environments they inhabit. In the immediate aftermath of the Exxon-Valdez, it was estimated that several hundreds of thousands of marine birds were killed. Further, after two decades, a number of marine-bird populations have not yet recovered in the areas affected by the Exxon-Valdez disaster. In contrast, taking advantage of government compliancy, Enbridge is moving full speed ahead to convince British Columbians that embracing their “Northern Gateway” pipeline project is in everyone’s best interests. With an enormous war chest, a phalanx of consultants, and a slicker than slick television advertising campaign, website and electronic newsletter, Enbridge is counting on a sophisticated public-relations effort to swamp any opposition to Northern Gateway. It’s enough to give one pause, as we approach the 20th anniversary of the Exxon-Valdez disaster later this month.